I became hooked on Tetris in a French ski resort in about 1989, and later obtained a copy for my now obsolete PC. So Tetris came to mind when I set out to become a Listener Setter. I submitted an earlier version of this puzzle in 2004, but failed to understand some of the constraints then applicable, and the puzzle was rapidly and rightly rejected as being too large. A few years later, following retirement, there was time to try again. The original idea seemed sound, but this time I would meticulously follow the very helpful guidance published on the Listener Crossword site. The concept was to have normal across clues and to have Tetris shapes to interlock with them instead of having down clues. I had not come across any other use of Tetris in The Listener, but it was possible that I had missed something. I have since seen a comment that the idea was first aired long ago, and I would be interested to know when and how. Given the ostensible theme of Tetris, was there some other hidden theme that could be found? The anagram of SITTER didn’t spark any ideas, nor the thought that TETRIS plus HELEN produces THE LISTENER. TRISTE did, however, ring a bell, not just from French but from Don Quixote – for some reason I had come across “the knight of the sorrowful countenance” as being the standard translation of “el caballero de la triste figura”. 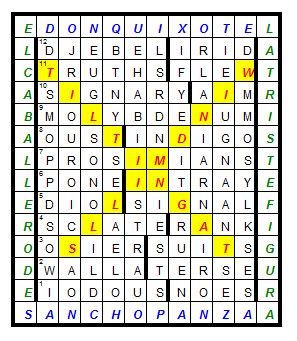 Wonderful – although I’m not familiar with Spanish cryptic crossword anagram indicators (if they exist), I felt that “triste figura” could surely be stretched to suggest an anagram of “triste”. (Whole treatises have been written on the meaning of “triste figura” – I am merely supplementing them.) So that gave me the cryptic theme. The Spanish phrase is helpfully in the Oxford Dictionary of Quotations and, not being in English, made it less likely that the puzzle’s mysteries would be quickly exposed. So Don Quixote and the phrase seemed suitable for the perimeter, but it was hard to find the precise words to fill the perimeter exactly. The puzzle’s grid had to be 14 by 12, so there had to be 48 letters. Various combinations of La Mancha, Cervantes, etc failed to work, but fortunately Sancho Panza did and, miraculously, he was the supposed author of the sobriquet. Don Quixote and Sancho Panza could be satisfactorily positioned across the top and bottom, with the phrase as the left and right columns. There are seven possible Tetris shapes, and they suggest letters, which led to the concept that the shape could be described by its letter as a misprint in the clue. Six shapes were obvious letters – O, I, T, L, S and Z, but the remaining one was a problem. I decided it should be “r”, albeit in lower case. It was only during the vetting process that I discovered that that shape is usually (where else?) represented by “J”; whilst this may have made clueing a little more difficult (the five “Z”s posed significant problems anyway), it would have been a more elegant choice. A perfect construction would have an equal number of each shape – hence the choice of a 14 by 12 grid, which could accommodate six of each shape. I failed to achieve this, but at least managed a reasonable balance: six of O, T and r, seven of I and L, and five of S and Z.
Forty-two 4-letter words would be excessive (and certainly not the answer to life, the universe and everything), so I decided to pair shapes to produce a number of 8-letter words. Ideally the join should have been in the middle of the word so that the eight letters could flow from first to last. This proved to be too demanding a constraint, so I accepted 8-letter words with the two shapes touching at any point. I was pleased to be able to fit in thirteen 8-letter words; unfortunately only five join at the middle of the word. To reinforce the theme I decided to place the phrase “TILTING AT WINDMILLS” in a centralised position, and crossing to suggest the shape of a windmill. (Tetris shapes can be rotated as they fall.) That produced a further severe constraint when filling the grid. 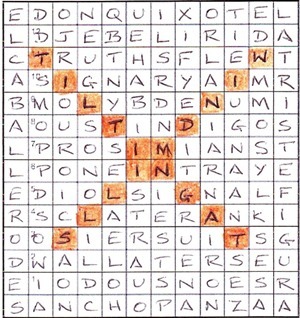 The across clues had to comprise ten letters, which could be one or two words. I had hoped to have at least four of these as 10-letter words, but this proved too demanding, particularly as “tilting at windmills” only left me three rows which did not have two fixed letters from that phrase. And those three rows were near the top and bottom where X, Q and J (among others) had fixed positions. I ended with just two 10-letter words. 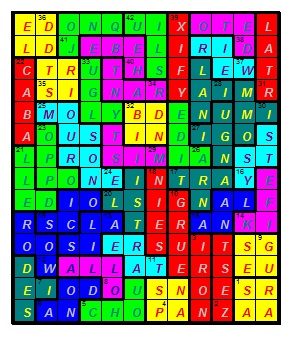 With the “double” shape clues, however, the average clue length was 5.65 letters, which seemed entirely acceptable. Filling the grid proved extremely time-consuming. Although there appears to be lots of flexibility, with the shape clues going in either direction, the constraints proved very difficult to manage. The perimeter and central phrase determined 66 of the 168 cells (almost 40%). Additional 10-letter words had to be sacrificed, sometimes in the interests of extra 8-letter words. Perhaps some neat programming might have helped, but that was beyond me. If one allows “checking” to include the perimeter contents and the central phrase, then I would claim that every cell is checked, and indeed eighteen are double checked. I am proud of that. The concept of a pangram never crossed my mind – in fact the puzzle falls short only by a “v”. As a novice at clueing, I found it quite difficult, and I recognise that some of the surface readings are not as felicitous as I would have wished. The 8-letter shape clues had to have two misprints, not unfairly located – all bar one having one in the definition and one in the wordplay. That raised some challenges – e.g. ENORMOUS has to have two Zs as misprints, though I was very happy with “Outsid(Z)e type h(Z)ero in counter claim”. Most of the across clues comprised two successive clues, which again complicated the production of satisfactory surface readings. I received a good deal of assistance from the editors in tidying up many of the clues to ensure that they met strict Listener standards and avoided deprecated constructions, but there remained a number where their slightly reluctant tolerance was appreciated. The across clues could have been clued separately, but that would suggest the need for bars and extra numbers in the grid. Bars were needed to show the shapes, so it was undesirable to have them in the rows. 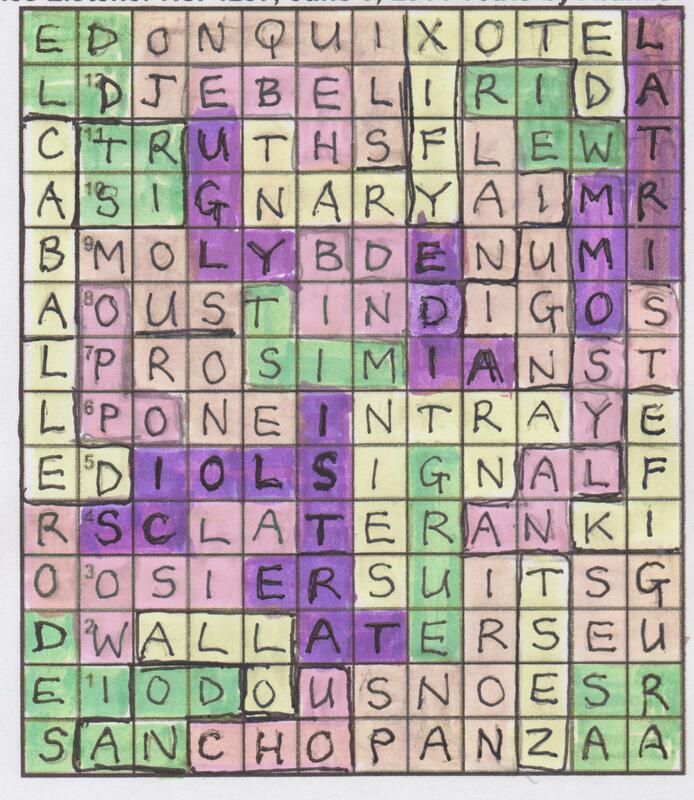 There was no symmetry in the across clues, so I decided to have them as one or two clues run together, leaving the solver to deduce the lengths and break in the two-word rows. The published solution shows bars to clarify the shapes, but the requirement to show bars in submissions was dropped during the editing process. Whilst this simplified submissions and checking, it had the disadvantage that it was possible to reach a solution without having solved all the shape clues. A nice suggestion was made that I might have required the Tetris shapes to be shown in their traditional colours. This would have produced a pretty end result. Of course, the original version of Tetris was monochrome, and there would also have been an issue about how to mark “tilting at windmills” – perhaps drawing straight lines through it would have made the point well. The puzzle was undoubtedly tough, but it was hard to judge just how difficult it would be. Clues could have been easier, and it was always an option to give word lengths. Space was a problem, so it helped a little to combine some across clues and omit clue lengths. 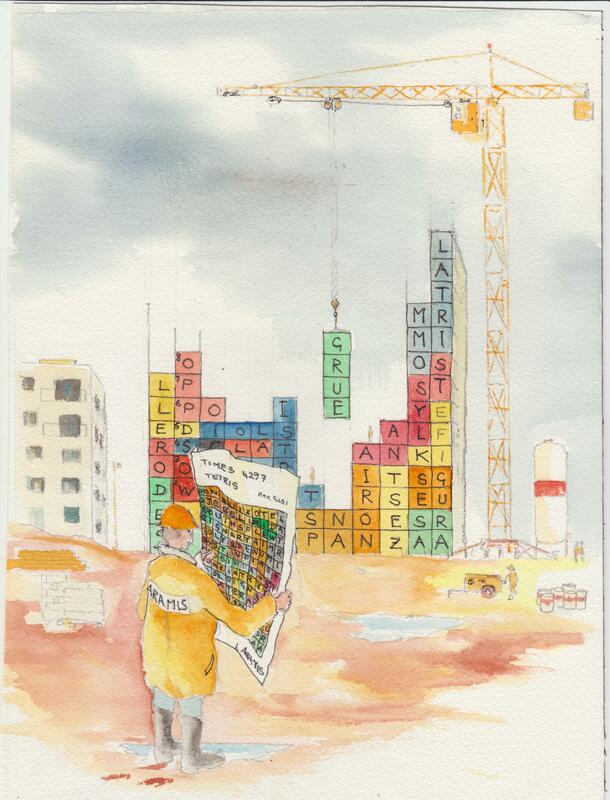 I originally submitted the puzzle in February 2013, when there was a substantial backlog of puzzles to be assessed. As a new setter I could expect no special consideration, so I was not surprised to hear little more than an acknowledgment for a long time. In December 2013, having been prompted by details of the Setters’ Dinner, I looked up Tetris on Wikipedia and discovered that it was originally released on 6 June 1984. The thirtieth anniversary was coming up (albeit with potential competition from the seventieth anniversary of D-Day), and I drew this to the editors’ attention. I suspect that that prompted them to have a look at the puzzle, and as a result, after a lot of assistance and some brilliant ideas from them, the puzzle was eventually cleared for publication. I must also thank my long-standing friend Bundle (who has not set for some years) for his considerable help, initially as a guinea pig and later in improving the grid and the clues. I have been fascinated and greatly gratified to read comments about Tetris (mostly extremely kind), both those forwarded by our wonderful statistician and those on another website. What enormous fun this was! It looked almost like a carte blanche with just that rather curiously inverted set of clue numbers and just the twelve across clues. We counted twenty-nine ‘shape’ clues of which thirteen were going to lead us to 8-letter words and the other sixteen to 4-letter words. There were going to be misprints but all the correct letters were restricted to the L,I,O,R,S,T and Z s of the shapes (with L and R mirroring each other and S and Z mirroring each other. A character and his sobriquet – well, that could be anyone, but a ‘sidekick’? There is Doctor Watson, there’s Batman’s Robin, Tonto for the Lone Ranger but who comes up first if you look up ‘sidekick’ on Google? Sancho Panza, of course. It made sense to attack the across clues and we did so with some trepidation but the first few solves were generous and we tentatively, after a bit of a Numpty spat about where to put them, slotted in PONE/IN-TRAY, TRUTHS/FLEW, WALLA/TERSE, OUST/INDIGO, SIGNARY/AIM and OSIER/SUITS. I think Aramis got this just right as those clues were almost at the Numpty ‘Stripey horse (5)’ level and allowed us to hope that we would complete the centre part of the grid and be able to drop in some Tetris shapes. The head scratching followed with a moment of sheer delight when I looked up lemurs (Those following a career in military intelligence answer “aye-aye” etc) and found the word PROSIMIANS. (OPPO from the shapes, had already appeared as the clue has figured three times in crosswords this week, so we suspected that the word was going to begin with a P.) Another solver has commented to me that that was his clue of the year. We teased out SCLATE/RANK, MOLYBDENUM, DJEBEL/IRID and with only NOES in clue 1, decided that it was worth while attempting to fit in our shapes. There was more generosity when Aramis told us that the shapes were dropping into the grid in listed order (though it took us a while to absorb the fact that we could place our solutions with that in mind). We began by spotting ANALYSTS, WEIR, ZEST, IRONPANS and OPPO and inserting those at the foot of our grid confirmed our initial suspicion. It had to be SANCHO PANZA emerging there. There was a moment of discouragement as, when we inserted SAAR and GUES and EFIK where they clearly had to go, we had the unlikely ARUGIFE climbing round our perimeter. Where we doing the right thing? A dinner date called and lasted till after midnight, so we slept on it. “What has Tetris to do with tilting with windmills?” somebody asked me and I gather that when you are playing the Tetris game, you are ‘windmilling’ the shapes when you start. One more bit of useless knowledge to store away in case someone else does another Tetris Listener grid in a few years’ time. Many thanks, Aramis. This was superb. A new setter this week in the shape of Aramis… and Tetris pieces. 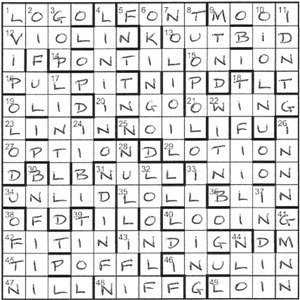 A blank grid, apart from twelve clue numbers, gave every indication that a fair amount of cold solving would be required. Across clues were either single clues or two run together. Shape clues, with answers entered as one or two of the seven Tetris pieces, had one or two misprints, depending on whether they were for 4- or 8-letter answers respectively. I liked that the misprints determined the shape that answers would take in the grid. It was obvious to start with the across clues since their entry positions were known. In fact, I spent longer than normal trying to cold-solve them compared to the time I normally spend on my first pass through the clues. Having done that, the grid was far from filled with most of my entries being in the top half. I wasn’t 100% sure that double across clues were given in the order of entry, but felt that the absence of “either clue may come first” made that likely. Thus 1b NOES, 2b TERSE, 3 OSIER & SUITS and 4a SCLATE gave me a reasonable start at the bottom. I got the first three shapes: SAAR (as a Tetris O), ZEST (as an I) and CHOU (an L) but really couldn’t be sure where they went. I also decided to make another assumption, namely that pieces didn’t have to be rotated and moved left or right to fit under an existing shape such as a T or an upside down L — not that I had anything in place yet. Shape 5 Coaxed protectively and admitting old bad idea looked like it should be ‘coated protectively’, and ANODISE was fairly straightforward with ‘idea’ needing to be changed to ‘ides’. These double clues with two misprints looked like they might be extra tricky — or triple tricky if I didn’t know where to place them. I decided to go back to the first part of 1ac At length I would be so offensive, moving one to front. It looked as though the definition was ‘at length I would be so’ but that led to nothing. A quick look in Chambers Crossword Dictionary helped me on my way, giving ‘odious’ for ‘offensive’, which Mrs B fails to do. Moving the I to the front resulted in IODOUS, and ‘I at length’ for Iodine became clear. Surely this wasn’t the work of a novice setter! As I managed to slot some of the shapes in place, I soon discovered SANCHO PANZA in the bottom row. That meant that we were in Don Quixote country, the name adopted by Alonso Quixano in the book by Cervantes. That didn’t seem to give enough letters to fill the rest of the perimeter, and I wasn’t sure where either name would end up sitting. So, slowly, I worked my way up the grid. This was hard going, but gradually the missing across entries and the devious little shapes filled their allotted spaces. However, neither of the endings of the left and right columns — ERODE and IGURA — seemed to be giving anything relevant. That is until I got as high as CABALLERO and FIGURA, and I decided that a bit of googling was required. Thus I got EL CABALLERO DE LA TRISTE FIGURA down the columns, with DON QUIXOTE along the top. A bit more work, and the grid was complete. I had been expecting to see TILTING AT WINDMILLS for some time, and there it was, not surprisingly in the shape of a windmill’s sails. And not forgetting Shape 24 Modern-day team a cat managed, first in table. For ages, I thought this must be an 8-letter entry but RANT was the only word unaccounted for in the grid. I toyed with ‘term a cat’, ‘tear a cat’ or ‘team a car’ as the corrected misprint, but it was looking up rant in Chambers Crossword Dictionary (not Mrs B) that alerted me to the obsolete phrase ‘tear a cat’, otherwise I’d never have dreamt looking that phrase up in Chambers itself (under tear1)! Were these really the clues of a novice setter? I may never know, but I found this a tough little nut to crack. I’m not sure whether the method of entry is considered thematic purely because Tetris is an anagram of Triste, but it was enjoyable… in a masochistic sort of way! Thanks, Aramis. Fahrenheit/Centigrade, The Flying Scotsman and the Dambusters raid are Ifor’s previous, and diverse, Listener puzzles. Here we seemed to be in theatreland, with a Playgroup, an author and a title to unravel. All answers were to be altered before entry but only the acrosses would be real words. At least we were given answer lengths, but the difference between those and the entry lengths varied significantly. For example, 1ac was (9) but only had an entry length of 4, whereas 5ac was (5) and 4 with 13ac (13) and 6. Part of a title would describe how answers were affected, with the rest of it appearing elsewhere. I checked the first and last letters of clues, but they revealed nothing. An appropriate number of down clues had an extra word or phrase and trhere was an isolated central square to complete. Part of me already knew that this was going to be tricky! I started off well, with 1ac LOGORRHEA and 9ac MOORISH, but both needed to be crammed into 4-letter spaces. It seemed that it wasn’t going to be as simple as vowels or consonants, but how about first versus second half of the alphabet? That would give OORR and OORS respectively. It looked like I could be on a roll. I turned my attention to the downs, and was a bit annoyed that I could solve none of the first four, but 6dn, a simple anagram of ‘shaking her so’ yielded ROCKING HORSE. I confidently entered RONORS into the grid. 7 and 8 eluded me, but 9dn was an anagram of ‘tradesmen’, ie SMARTENED. I got ready to enter SRTN, but saw that 9ac began with O. Oh dear! 10dn was CORIOLANUS with ORONUS itching to get into its 6-letter slot, but also failing to mesh with [m]OOR[i]S[h]. For want of something better to do, I reread the preamble. “Only across entries are real words or phrases.” Idiot! Back to the drawing board. I also failed with the anagram in 12ac A vole in endlessly rich novel, like Ratty (10) (it would turn out to be ARVICOLINE, a new word to me), but 13ac Route arranged, book travels on Scottish islands (13, two words) gave OUTER HEBRIDES and OUTBID popped into my head. So, in this case, ERHERES would be dropped. What if 9ac was MOOI and 9dn SMARTENED entered as MTND (omitting RSH and SAREEE respectively)? Everything would fit then. 10dn was an anagram of ‘social roun[d]’ to give CORIOLANUS which needed its initial C to be omitted. I doodled ERHSAC as letters that were being dropped, et voilà — SEARCH. This led me to think of Hide and Seek which kids play in a group. Everything was coming together nicely… again! After 90 minutes, a fair smattering of the grid was filled. This included 3dn Burrow hunting animals pass through by means of picking up trail of stench (6) GOPHER (which I temporarily assumed was both singular and plural) and wondered why they were described as ‘burrow hunting animals’. I checked Chambers and, after dropping the extra word ‘hunting’, thought Ifor was being a bit sloppy calling them just ‘burrow animals’. I had also solved 22dn Slough council want Independent sacked (5) to give WITAN with ‘slough’ as the extra word and Mrs B helped me to identify ESCHAR, and that was an anagram of SEARCH. I could also see KING OF LOONS trying to appear in the central column but I resisted googling that. 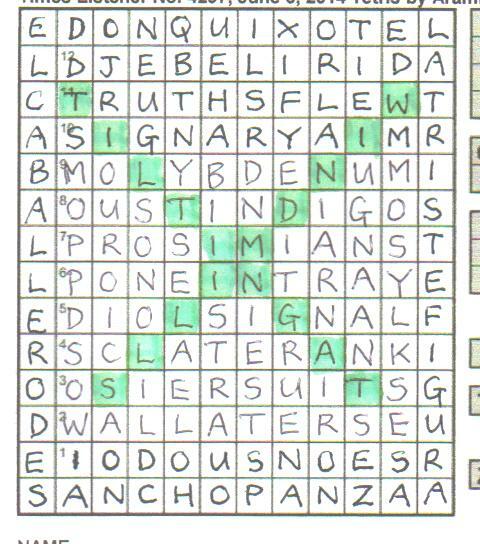 It took me another two hours or so to polish off the grid and identify the extra words in the down clues. These were ‘hunting animals’ RACHES (Ifor wasn’t being sloppy at all, and burrow and gopher were being used as verbs), ‘Hotelier’ SACHER (not in Chambers thought I, until I saw that he is mentioned in the entry for Sachertorte), ‘slough’ ESCHAR, ‘odd jobs’ CHARES, ‘spans’ ARCHES and ‘one following’ CHASER. We thus had six anagrams of SEARCH, but no link that I could see to the children’s game of Hide and Seek! It took me a full half hour to work out what was going on, and it was another instance of it just popping into my head. Six Characters in Search… gave us the description of what was removed from the answers, and of course …of an Author appeared elsewhere — in the preamble! A delightful bit of misdirection. Thus PIRANDELLO, thematically missing his R, A and E, could be found in the main NW-SE diagonal, requiring a D to be entered in the central square. A thoroughly entertaining puzzle with an excellent implementation of its theme came to a close. Thanks, Ifor.